This park was known as Warner Bros. Movie World Germany at the time this trip report was written. The ride names from that time have been left in place in this report. Nine months ago my travels brought me to Parque Warner Madrid, a clean and bright park filled with thrilling rides. As such I was particularly looking forward to more of the same, and a bright blue sky seemed the icing on the cake. Unfortunately, the only thing this park has in common with its Spanish cousin is its name; Six Flags policies could be found all over the place, and there were no decent rides whatsoever. Our morning began with an exclusive session on Wild Wild West Bandit (#310), the parks wooden coaster. It was only good manners that made me ride this three times, and indeed by the time we left the session there were very few people hanging on for more. Most had chosen instead to stand in the line for Eraser MP-Xpress (#311), the second (and last) SLC of the trip. Once again my darling brother became the only person in the club to enjoy it; at some point I will need to introduce him to a B&M inverted so he sees what the ride might have been. The third coaster of the morning was amazingly the most violent yet. Lethal Weapon Pursuit Cop Car Chase (#312) was originally designed as a twin track duelling coaster, though the park generally only runs one side of it presumably to save money. The first half of the layout was moderately bumpy, albeit nothing unmanageable. The inline twist, however, was acutely painful thanks to the awful restraint design. Even Andrew complained about it, which says something. Only true credit whores would wait half an hour to ride Coyote's & Roadrunner's Achterbahn Backyardigans Mission to Mars (#313). The ride at least looked good thanks to its mountain theming, but the train was shuddering a surprising amount for a ride that peaks at just over twenty miles per hour. With that done, we had just one remaining credit; a standard Mack wild mouse called Tom & Jerry's Mouse in the House Ghost Chasers (#314). Though a production design this managed to be the best coaster in the park, purely because all the rest were truly awful. Having never ridden one before, I dragged Andrew over to The Wild Bunch, an Intamin Floorless Tilting Gyro Drop. 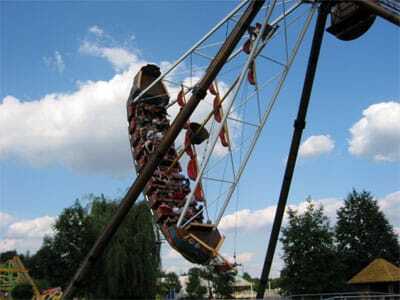 As the name suggests this is a drop ride, albeit one where passengers are harnessed in a standing position while straddling a bicycle saddle type seat. This was to be blunt not suitable for the male anatomy. I was expecting a rather abrupt stop at the end of the ride, but I wasn't expecting the climb to the top to hurt too. 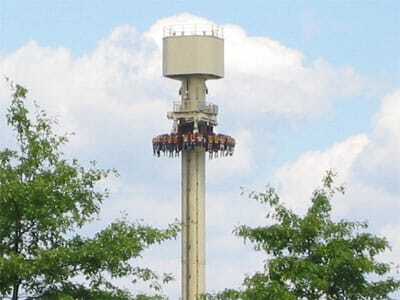 Once was quite enough; the drop itself was fun, but the rest of the experience was far too painful to be enjoyable. It was testament to how much we were enjoying ourselves that a total of twenty six of us, nearly a third of the group, met up at lunch time and walked a kilometre down the road to somewhere else. The staff at Schloß Beck were more than a little disconcerted at such a large group of adults arriving, and kept telling us we were in the wrong place, but eventually the message got through, and we were able to enter at the group rate of €5.50 per head. The Familien-Achterbahn (#315) was arguably more fun than any of the coasters in the bigger park, not least due to each ride consisting of five full circuits. Unusually for us however the coaster took second place to the large collection of self operated rides. One could easily have spent hours here, but with limited time we chose to try two; the Seilbahn, a single seat that travels back and forth across a river, and the Wasserbobs, a unique single person water ride where a boat is towed backwards up a hill and released. The boat flies completely into the air before splashing down in a small pond. The self operated rides would never work anywhere else, as they require all those present to read and obey posted safety instructions. American lawyers would have a field day. Our second surprise park of the trip was located behind a massive shopping mall. Its star attraction is Speedy (#316), my first encounter with a compact spinning mouse coaster that wasn't built by the French. The ride proved surprisingly good albeit not quite as refined as the standard design that we all know so well. Park management let us enjoy a water cup challenge on the ride, where most people attempted not to spill their full water cups while the ride was in motion. This was needless to say a fools errand, and those of us who realised this early chose instead to just throw the water directly at certain people! The staff also arranged a few special rides on the Pirat. We were told that this ride is normally operated at 85% power to avoid making guests ill, but that we could try it a few times at full power. With the boat full of club members we engaged in a ridiculous stunt of reverse cheering; instead of cheering at the peaks of the arc the group instead cheered every time the ride went through the middle. The other park guests must have thought (correctly) that we were completely insane. On the way out of the park, we were shown the demonstration Coasterdynamix model roller coaster, which is one of the most impressive models I've ever seen. It would be wonderful to own something like this, but I couldn't possibly justify the cost (and besides there's no way I've got anything like enough space for the assembled model). With luck the designers will eventually come up with a smaller (and cheaper) version for those of us without spare rooms in our homes.